Roller Les says ‘aye’ to a pie – again! 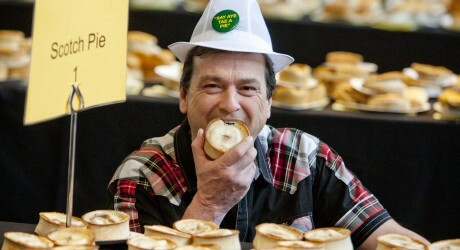 Bay City Rollers’ front man Les McKeown has confirmed that he will be a judge at the 16th World Scotch Pie Championships which takes place at Dunfermline’s Carnegie Conference Centre next week . Les, the voice of the 70’s supergroup with hits such as Bye Bye Baby, Shang A Lang and Give A Little Love, said: “I am known for my love of a great pie and I always stock up when I am on home ground. Touring non stop around the world with the band means we need to keep our strength up so we always say ‘aye’ to a pie! The competition is supported by Scottish Bakers and the Scottish Federation of Meat Traders. Both trade associations actively support and promote bakers and butchers in Scotland by encouraging and sharing best practice. In addition to Scotch pies, bakers and butchers are invited to enter their best sausage rolls, bridies, specialty savouries, Scottish football pie, apple pie or savoury. Butchers and bakers across Scotland will have the opportunity to become recognised as producing the highest quality products around the globe with awards given to those producing the best products in each category. The winner of the Scotch Pie category will be declared World Champion. The competition, which has run for 16 years, aims to highlight that bakers and butchers create high quality artisan pastry products. Recognising the ‘great and the good’ in this way rewards excellence and raises the bar in the industry.